Photo by Dan Levy from the Torontoist Flickr pool. 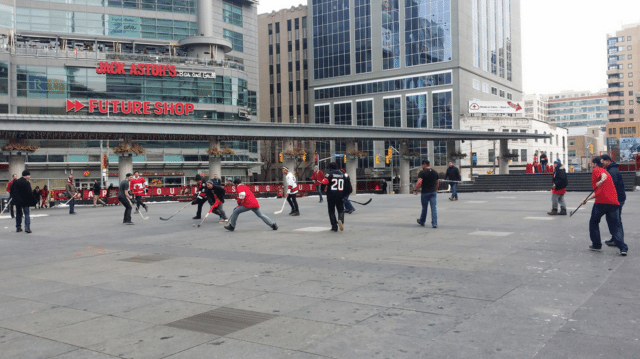 Children and Youth Services Minister Michael Coteau, an MPP who is not a city councillor at all, is still urging Toronto city hall to lift the ban on road hockey, and other games played in the street. Coteau’s reasons include the obvious, exercise and fun, as well as the abstract, like building relationships, and learning social boundaries. As it stands, the only group that seems to be against lifting the ban are the notoriously anti-fun lawyers. The issue has come up before, but council decided that since this ban is rarely enforced, there’s no reason to amend it. A life of crime has alluring aspects to it. That’s why so many successful movies and TV shows centre around criminal anti-heroes. That allure fades quickly when you find yourself impersonating a Canada Post employee and waiting outside people’s houses waiting for the electronics you bought to come in the mail, like this guy did. The scheme involved using stolen credit card information, buying products online, and then waiting in front of houses when they were shipped. Sometimes, the man would have to pretend to be the mail deliverer and tell his victims that Canada Post delivered the package in error, and they need it back. He’s no Walter White, so instead of barrels full of money, he ended up with a drone from Best Buy. We’ve all been there. Someone is misbehaving on the TTC, and we’re not really sure what to do about it. Because living in a city has melted away whatever politeness once lived inside of us, we usually just look away and crush some candy. Soon though, we’ll be able to take pictures of those people and share them with the TTC. The app should be ready sometime next year, and is meant to help improve rider safety, though having a picture of a dangerous person may not actually make you safer while you’re trapped in an underground cylinder with them.